Q: Will someone from Goodlett Manor be there during my event? A: Sometimes, but if not, someone will be on call..
Q: Does Goodlett Manor provide catering, floral arrangements or other services/rental materials? A: No. Goodlett Manor does not provide catering, decorating or furnishings. However, we work closely with many area vendors and will be happy to meet with your vendors to assist in the planning of your event. Check out the vendor links by clicking on the Links page button above. Q: What is the best layout for my event at Goodlett Manor? A: We let the event planner or bride decide what fits their event best. We can make recommendations of unique uses for the house, porches and gardens. Previous events have incorporated everything from food buffets and drink bars to dance floors and banquet areas. The interior rooms have held up to 300 people comfortably and the entire Manor with tents has accommodated receptions of up to 850 guests. Q: Are candles or fountains allowed at Goodlett Manor? A: Fountains and extremely limited candles may be used if set-up and administered by a professional decorator, florist or caterer. In addition, sparklers are permitted on the grounds; however, fireworks may not be used anywhere on the property. A: Ample street parking is readily available for Goodlett Manor around the old courthouse square, plus a public parking lot just one building west of us on the corner of West Jefferson St. and North Thomasson Street. Q: What mechanical improvements have you made to the property? A: The building had new central heating and air-conditioning installed in 2009 and offers a completely remodeled Carriage House for ample restroom facilities, plus an inside catering area for your convenience. Q: Can I throw rice/birdseed/confetti? A: Rice and birdseed may be thrown outside only. Confetti, however, is not allowed anywhere on the property. 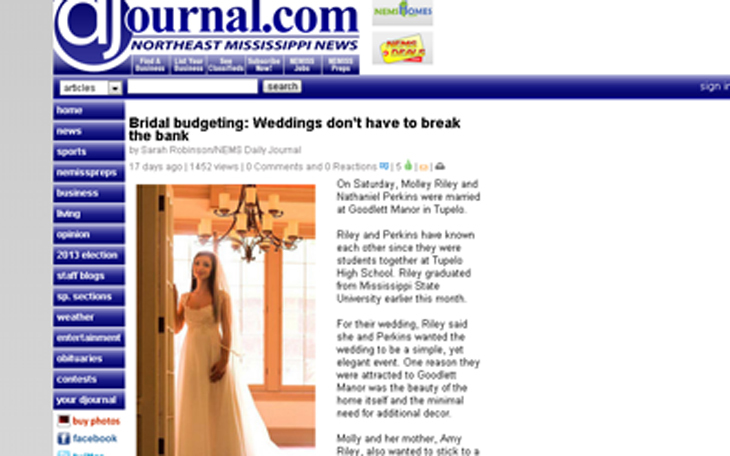 The Northeast Mississippi Daily Journal has written an interesting story on planning your wedding or event at Goodlett Manor. Click here or on the image above to read the story in a new web page or browser tab.